Contactor dropout, because of power line brownouts, will be eliminated when a KnowTrip® is added to the contactor. The KnowTrip® is a patented device manufactured by SCR Controls, Inc., Matthews, NC,	under license from Duke Energy. A contactor with the KnowTrip® attached will not drop out until the line voltage has dropped below 30VAC (All Model 120's). After the contactor has dropped out, it will not pull in again until the line voltage exceeds 70VAC (All Model 120's). The hysteresis prevents chatter and contactor. coil burnout. Model 120HP .5 - 7.9 ohms 30vac 70vac 4.6" x 6.2" x 2.3"
Model 120 8.0 - 35 ohms 30vac 70vac 1.75" x 1.15" x .75"
Model 120-8.5 36 - 200 ohms 30vac 70vac 1.75" x 1.15" x .75"
Model 120A 201 - 800 ohms 30vac 70vac 1.75" x 1.15" x .75"
Model 120B 801 ohms & up 30vac 70vac 1.75" x 1.15" x .75"
All Model 120's are fully automatic and are rated up to 50°C ambient temperature. Model 240A 5 - 35 ohms 70vac 180vac 4.6" x 6.2" x 2.3"
Model 240B 36 - 150 ohms 70vac 180vac 4.6" x 6.2" x 2.3"
Model 240 151 ohms & up 70vac 180vac 4.6" x 6.2" x 2.3"
Model 240A and Model 240B are fully automatic. Model 240 is adjusted by setting a pot according to coil ohms. All units are rated up to 50°C ambient temperature. Model 480 151 ohms & up 125vac 360vac 2.0" x 3.0" x 1.4"
All Model 480's are adjustable and are rated up to 50°C ambient temperature. Turn off power and measure the contactor coil resistance. Models 120/A/B/HP and 240/A/B skip to step 6. If your coil resistance is 150 ohms or less you must install the RC4 line suppressor (go to step 4). If your coil resistance is more than 150 ohms you do not need the RC4 (go to step 6). Remove incoming power wires A and B (see Figure 1) from the contactor coil and attach them to the black wires from RC4 (see Figure 3). Connect the yellow wires of the RC4 to the yellow wires of the Model 480. Skip to step 7. Remove incoming power wires A and B (see Figure 1) from the contactor coil and attach them to the yellow wires of the KnowTrip® (see Figure 2). Connect the red wires from KnowTrip® to the contactor coil. Mount in desired location near contactor. MODEL 480 AND 240 ONLY: Use a small screwdriver and adjust the potentiometer to match the contactor coils resistance (see Figure 4). If you do not know the coil resistance leave the potentiometer fully counter clockwise (CCW). The KnowTrip® may not work if it is not adjusted properly. To better set the potentiometer, monitor the contactor to see if it drops out. If it does, increase (CW) the setting 1/8 of a turn at a time until the contactor no longer drops out (DO NOT exceed 3/8 turn past recommend setting). 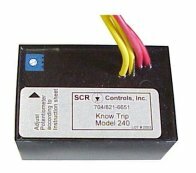 A contactor may have 25% more inrush current when used with a KnowTrip®. This extra current could cause a problem if the contactor is used with a PLC. The KnowTrip® has a one-year warranty on device parts. SCR Controls, Inc. is not responsible for lost production or damage caused by device failure.